For many on campus, fashion is merely a passion, not a career path they imagine being attainable. BU’s Fashion and Retail Association is hoping to change that. 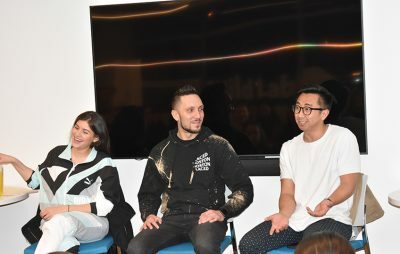 In partnership with the Fashion and Retail Association, the Music Business Club hosted their “Music Meets Fashion Panel” Wednesday night at the BUild Lab. The panel was open to BU’s community and featured three fashion industry professionals, two of whom were BU alums. The panel was moderated by Jocelyn Roseman, the president of BU’s Fashion and Retail Association and a senior in Questrom. Roseman asked panelists about topics like career development, how music and fashion fit together and how artists and brands work to create identity. Two panelists, Anai Sanchez Riveron and Anthony Tran, graduated from BU with degrees in public relations and mechanical engineering, respectively. Sanchez Riveron is now the global relations coordinator at Puma headquarters in Boston. Tran works as a creative developer for Converse. Joamil Rodriguez already owned a skate and snowboard shop when the opportunity arose to purchase a local sneaker store, and he decided to take a risk and buy it. Now, Rodriguez owns the high-end sneaker consignment store called Laced, located in Boston’s South End. All the panelists said music often plays a crucial role in their industries. Rodriguez, for example, used celebrity guest appearances at his store to help get his new business off the ground, inviting artists like French Montana and Kendrick Lamar. “We found a marriage, putting sneakers and music together,” he said. For Tran, working at Converse, music and fashion are synonymous. Recently, Frank Ocean was seen wearing one of his designs. After pictures were released, sales skyrocketed. The most challenging part is making that collaboration look effortless, Sanchez Riveron said. For both brands and artists, Tran said, partnership is all about trust. For most collaborative deals between brands and artists, the artist gets full creative rights, and they will usually change their mind, both on concept and artwork. For Puma, Sanchez Riveron added, there’s been a big creative shift from companies collaborating primarily with athletes to working more with artists. “Even though we work with people that don’t have an association with sports, we still want to push them to think in that direction, to create something that is sports connected,” she said. The turnout for the event was exciting, Roseman said. The panel was the culmination of various fashion and style clubs around campus looking to combine resources, interests and people. Everyone sees unique styles walking down Commonwealth Avenue, Roseman said, but she still feels that opportunities for studies in style and fashion are lacking. It’s important, Roseman added, to realize that fashion is far more than what most people see. Mohaghegh was only a freshman when she abandoned her pre-med track to create BU’s Music Business Club. She said Boston has made her work harder to find the music and fashion scenes.